Human activities are changing the cycles of carbon and nutrients in freshwater systems and we have to know what the consequences are. Which processes govern the recycling of nutrients, the elimination of pollutants, and the emission of trace gases in natural waters? How are dams affecting river ecosystems? Our team combines chemical sensors, stable isotope techniques, molecular ecology and numerical modeling to find quantitative answers. Collaboration across disciplines is required to establish the scientific facts needed for a more sustainable management of aquatic resources. We investigate the process of anaerobic methane oxidation in the water column of different lake systems. 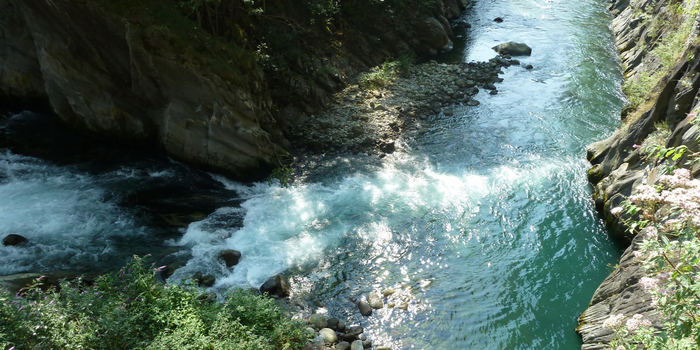 How are dams changing water quality in tropical African rivers? Many Rivers carry high loads of nitrogen due to leaching of agricultural fertilizers. Wetlands can help mitigating nitrogen eutrophication of coastal waters. Methane-oxidizing bacteria represent a major biological sink for methane and are thus Earth’s natural protection against this potent greenhouse gas. Here we show that in two stratified freshwater lakes a substantial part of upward-diffusing methane was oxidized by filamentous gamma-proteobacteria related to Crenothrix polyspora. These filamentous bacteria have been known as contaminants of drinking water supplies since 1870, but their role in the environmental methane removal has remained unclear. While oxidizing methane, these organisms were assigned an ‘unusual’ methane monooxygenase (MMO), which was only distantly related to ‘classical’ MMO of gamma-proteobacterial methanotrophs. We now correct this assignment and show that Crenothrix encode a typical gamma-proteobacterial PmoA. Stable isotope labeling in combination swith single-cell imaging mass spectrometry revealed methane-dependent growth of the lacustrine Crenothrix with oxygen as well as under oxygen-deficient conditions. Crenothrix genomes encoded pathways for the respiration of oxygen as well as for the reduction of nitrate to N2O. 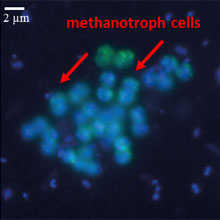 The observed abundance and planktonic growth of Crenothrix suggest that these methanotrophs can act as a relevant biological sink for methane in stratified lakes and should be considered in the context of environmental removal of methane. Lipid biomarkers were analyzed in Lake Van sediments covering the last 600 ka, with a focus on the period between 110 and 10 ka, when a broad maximum in pore water salinity as a relict from the past suggests dry conditions. The occurrence and distribution of biomarkers indicative for terrestrial plants (long-chain n-alkane C29), haptophyte algae (methyl alkenones C37) and halophilic archaea (archaeol) all point toward a dry climate in Lake Van region during this time interval. The hydrogen isotopic composition of C29 n-alkanes (δDC29) and C37 alkenones (δDC37) is enriched between MIS 4 and MIS 2, which is interpreted as a decrease in the regional ratio of precipitation to evaporation. Similarly, the low abundance of the acyclic glycerol dialkyl glycerol tetraether GDGT-0 relative to archaeol, quantified by the Archaeol and Caldarchaeol Ecometric (ACE) is assumed to reflect the presence of halophilic euryarchaeota adapted to high salinity water. The climate around Lake Van appears in phase with the Yammouneh basin 800 km southwest and Lake Urmia 250 km southeast of Lake Van over the last two glacial periods. The results highlight the potential of combining ACE, δDC29, and δDC37 for reconstructing salinity changes and regional precipitation to evaporation ratio from lake sediments. Tropical inland waters are increasingly recognized for their role in the global carbon cycle, but uncertainty about the effects of such systems on the transported organic matter remains. 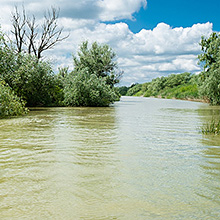 The seasonal interactions between river, floodplain, and vegetation result in highly dynamic systems, which can exhibit markedly different biogeochemical patterns throughout a flood cycle. In this study, we determined rates and governing processes of organic matter turnover. 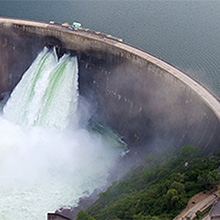 Multi-probes in the Barotse Plains, a pristine floodplain in the Upper Zambezi River (Zambia), provided a high-resolution data set over the course of a hydrological cycle. The concentrations of oxygen, carbon dioxide, dissolved organic carbon, and suspended particulate matter in the main channel showed clear hysteresis trends with expanding and receding water on the floodplain. Lower oxygen and suspended matter concentrations prevailed at longer travel times of water in the floodplain, while carbon dioxide and dissolved organic carbon concentrations were higher when the water spent more time on the floodplain. Maxima of particulate loads occurred before highest water levels, whereas the maximum in dissolved organic carbon load occurred during the transition of flooding and flood recession. Degradation of terrestrial organic matter occurred mainly on the floodplain at increased floodplain residence times. Our data suggest that floodplains become more intense hotspots at prolonged travel time of the flood pulse over the floodplain. A promising profiling setup for in situ measurements in lakes with potentiometric solid-contact ion-selective electrodes (SC-ISEs) and a data processing method for sensor calibration and drift correction are presented. The profiling setup consists of a logging system, which is equipped with a syringe sampler and sensors for the measurement of standard parameters including temperature, conductivity, oxygen and photosynthetically active radiation (PAR). The setup was expanded with SC-ISEs in galvanically separated amplifiers. 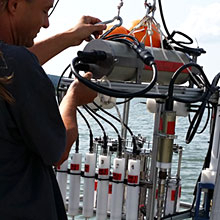 The potential for high-resolution profiling is investigated by deploying the setup in the eutrophic Lake Rotsee (Lucerne, Switzerland), using two different designs of ammonium sensing SC-ISEs. 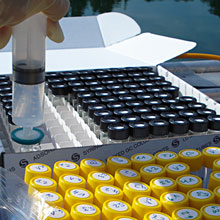 Ammonium was chosen as a target analyte, since it is the most common reduced inorganic nitrogen species involved in various pathways of the nitrogen cycle and is therefore indicative of numerous biogeochemical processes that occur in lakes such as denitrification and primary production. One of the designs, which uses a composite carbon-nanotube–PVC-based membrane, suffered from sulfide poisoning in the deeper, sulfidic regions of the lake. In contrast, electrodes containing a plasticizer-free methacrylate copolymer-based sensing layer on top of a conducting polymer layer as a transducer did not show this poisoning effect. The syringe samples drawn during continuous profiling were utilized to calibrate the electrode response. Reaction hotspots and steep gradients of ammonium concentrations were identified on-site by monitoring the electrode potential online. 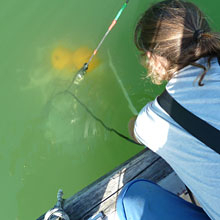 Upon conversion to high-resolution concentration profiles, fine scale features between the calibration points were displayed, which would have been missed by conventional limnological sampling and subsequent laboratory analyses. 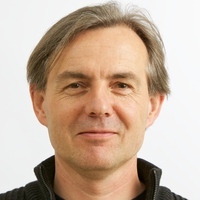 Thus, the presented setup with SC-ISEs tuned to analytes of interest can facilitate the study of biogeochemical processes that occur at the centimeter scale.